V Series version of KHHI's elite khukuris come in series of sizes, ranging from 7 to 12 inch long blades ..
V for versatile, V for vicious, V for victor, V for vim and V for value, and ‘Series’, because this version of KHHI’s elite khukuris come in series of sizes of blades ranging from 7 inch to 12 inch long, thus the name has been given so to properly personify the khukuris. The unusual almost semi-circle (Crescent) shape of the khukuri without shoulder and peak is forged for easier handling, better performance and to create a more practical cutting tool. The shape of the V series is fairly curved thus it facilitates the cutting and chopping activities further better. On top of that the blade has a style of its own, never done before in any other knives by KHHI. The blade has a unique feature with two large divisions, the bevel and panel. The large elongate bevel is unpolished where as the panel that run across the body to the riccasso is highly polished. This finishing of V series is strange yet stylish plus carries a good reason behind. Since the bevel is unfinished it skips the long harsh process of getting polished as a result the temper (hardening) is retained, as it was while tempering and hence the edge remains as strong and rigid. On the other hand the panel is highly polished, means some temper is withdrawn intentionally as it gets heated when getting polished. The Panel thus becomes little softer, providing cushion to the bevel. When the blade is stroke against a target, the bevel penetrates through while the panel gives the needed suspension to the bevel so that force generated in the action can be minimized, lessening tension to the bevel. This new method of finishing the blade has proven very successful and satisfactory. Handle of V series is a simple wooden handle with full flat tang fixture that would simply provide good grip and long life. The handle is reinforced with rivets to strongly secure the fixture. The two wooden scales are first glued to the tang by using epoxy and 3 x rivets are fitted to complete the handle. A lanyard hole facility is also in place; for a leather thong to go through it and round the using hand’s wrist. The contours, ridges, surfaces and the handle itself is made thicker to provide comfortable grip even for big hands. 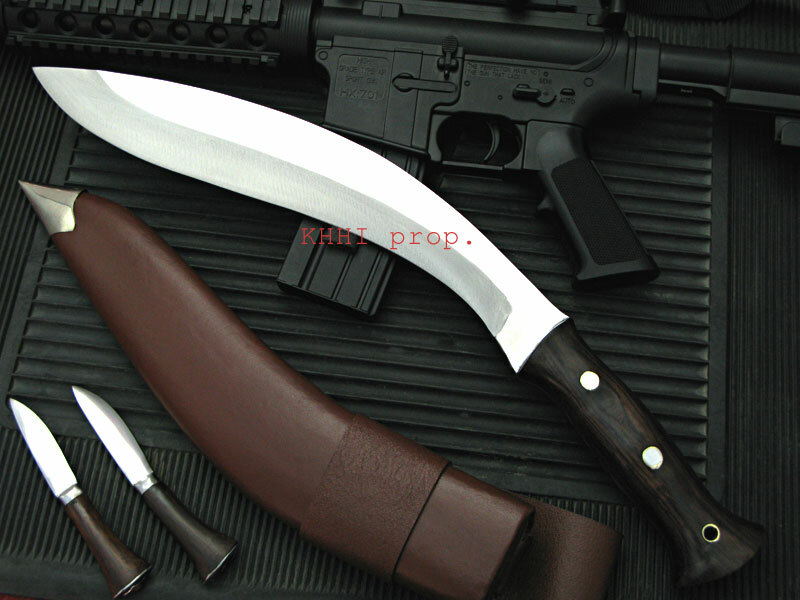 The V series has a beautiful reddish brown leather scabbard made to go with the overall look of the khukuri. A white metal chap compliments the dashing and dangerous look of the knife. A set of special Karda + Chakmak accompanies the V series to further boost the ability and value of this extra ordinary khukuri knife unleashed by KHHI. (V Series comes in various sizes from 7-12 inches blade. Please write your preferred size in the “Comment/Message” field when ordering. 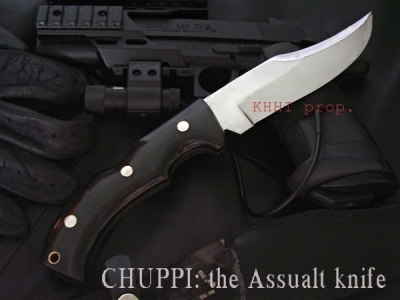 For example V7, V8, V9, V10…) so the most versatile series of kukri.